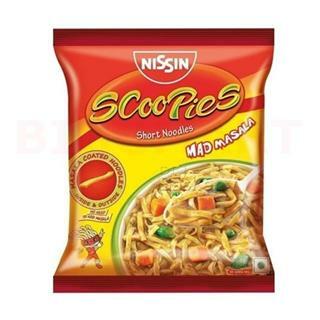 Buy online Nissin scoopies short noodles in grocery store Pune. Introducing Nissin Scoopies, masala coated short noodles, which are really easy to cook and taste delicious in rich gravy. 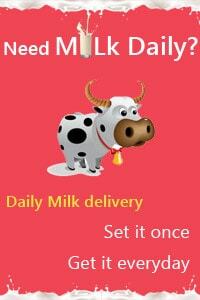 Ingredients: Wheat Flour, Edible Vegetable Oil (Palm & Palmolein), lodised Salt, Spice Mix- 2.96% (Turmeric, Cumin, Onion, Garlic, Coriander, ChillI, Ginger, Black Pepper, Fenugreek, Clove, Cinnamon, Green Cardamom & Nutmeg), Sugar, Corn Starch, Hydrolysed Vegetable Protein (Soya), Acidity Regulators (INS 500 (i), INS 330, INS 451 (i)), Flavour Enhancers (Yeast Extract, INS 631, INS 627), Thickener (INS 415) & Antioxidant (INS 319).